There were several moments this week when I knew the Christmas spirit had officially entered the Lyons Den. Granted, if you were to go by the store windows, the Christmas season actually started the day after Halloween but, we like to take things a bit more slowly around here... or, perhaps better put, we have to take things a bit more slowly. Between birthdays and work days and play dates and sick days, it's hard to even find the time to trim the tree. And, as I recently discovered, sometimes the spirit of Christmas sneaks into the most unsuspecting of places. Here are my Top 10 signs that it's officially Christmas in the Lyons Den. The stockings are hung by the chimney with care. Well, perhaps not with all that much care but, they are definitely there! All seven of them plus one for the dog that still needs a hook. Hopefully that hook will arrive before Christmas. - Our porch is glistening with twinkly Christmas lights. I'm a white light gal myself but, after spending the better part of an afternoon searching for the one in a million replacement bulb on our ten year old strand, my poor hubby tossed in the towel, hightailed it to Home Depot and purchased the brightest lights you've ever seen. The first night they welcomed me home from work, I thought there was a cop car or disco ball on our porch. So much for a "white" Christmas! - The kids have all decided what they want from Santa... and the triplets have once again confirmed that "identical" only goes so far. One wants a teddy bear and Pokemon cards (I suspect his big brother planted that seed! ), one wants puzzles and much to my husband's dismay, one wants a "baby and a stroller." Got it Santa? - The aroma of Christmas is in the air. In addition to a fondness for white lights, I also have a keen appreciation for Christmas candles; I've always loved the welcoming smell of cinnamon and that seasonal sniff of evergreen. I appreciate it even more now that my house is a urinal. With three three-year old whizzers freeing willy whenever and wherever they can, our house typically stinks like a city subway in the summer heat. In a word: piss. Thankfully, eau de pee has been replaced by Mrs. Meyer's long-burning scents of the season and I for one am thrilled. - The dog is wearing reindeer antlers. 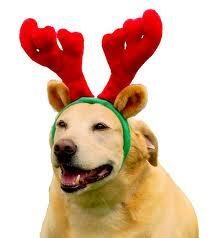 That poor pet whose stocking has yet to be hung has been temporarily transformed into a reindeer. What amazes me most is that he actually puts up with it. I swear he knows we're laughing at him yet he just hangs his head and tolerates it. If that stocking ever gets hung, it really should be filled with a whole lot of dog treats! - The kids are wearing Santa hats. Well, two of them are anyway. The other three are miserable because they don't have Santa hats but, well, Christmas is coming! - We had -- and survived -- the annual Christmas tree debate. The whole "it's too fat/thin/tall/short/crooked" altercation never gets old for us. We just can't agree on a tree. So this year, we decided to let the kids pick it; this way, if it's not absolutely perfect, we can blame them. And we did. Our goofy tree is as crooked as can be and looks like someone took a hacksaw to one side. Next year, we pick the tree! - I cried. I don't what it is about Christmas-time but it makes me super-sentimental. The songs, watching my kids watch the classics of my childhood (Rudolph, Frosty, etc. ), it all gets the tears flowing. Fortunately, laughter often follows -- especially when my tots ask things like "what we watching for?" in response to the opening line of "Santa Clause is coming to town." My feisty fella had a point, what are we watching out for anyway?! - I had a moment when I felt truly blessed and grateful for all I have and, in particular, for my family. And, in particular, for my sister. This is the one that happened in the most unsuspecting of places -- a dressing room in the lingerie department of Lord & Taylor while she breastfed her three week old daughter. There we were. Three girls surrounded by bras, just having girl talk. It was that simple. And that awesome. - I was suddenly filled with the spirit of Christmas which, for me, is more than those garish lights that grace our porch or the stockings that grace our mantle or the hats or antlers that grace the heads around me. It's what's in those heads that counts. And what's in mine, for the moment at least, is a sense of wonder for our incredible family. I'm going to enjoy while it lasts because I'm pretty sure this wonder will fade once the house smells like a urinal again!